This is is my second review of Tolkien’s Lord of the Rings series. You can find my review of The Fellowship of the Ring here. But so our path is laid.’ ‘Yes, that’s so,’ said Sam. ‘And we shouldn’t be here at all, if we’d known more about it before we started. But I suppose it’s often that way. The brave things in the old tales and songs, Mr. Frodo: adventures, as I used to call them. I used to think that they were things the wonderful folk of the stories went out and looked for, because they wanted them, because they were exciting and life was a bit dull, a kind of a sport, as you might say. But that’s not the way of it with the tales that really mattered, or the ones that stay in the mind. Folk seem to have been just landed in them, usually – their paths were laid that way, as you put it. But I expect they had lots of chances, like us, of turning back, only they didn’t. And if they had, we shouldn’t know, because they’d have been forgotten. The problem with a compelling series is that you read all of the books quickly and they blend together. You can’t necessarily remember what happened in which book. 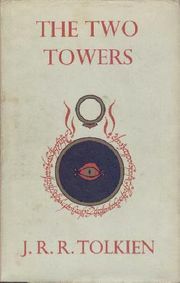 However, after reading The Hobbit (reviewed here) and the Lord of the Rings trilogy, I can remember that I found The Two Towers to be the most entertaining, hopeful, and haunting of the four. There weren’t as many pages of contemporaneous song lyrics and Middle Earth history lessons. It was my personal favorite because it shows so well the burden of good, and the even greater death sentence of evil. I found the book to be helpful guide in a time of social and political unrest. For me, though assuredly not for everyone (it is, after all, a fantasy story and not real life), it was a reminder that good is worth fighting for, even at the cost of death, and that some fates are worse than death. I highlighted several passages and lines that I found useful in my daily life, and in making sense of the world. While I have not searched much to see if others have made similar comparisons, I found the fate and duty themes in the book similar to those found in the Bhagavad Gita. The combination of the English stiff upper lip, stoicism, and playing one’s role in a larger story rang true and deeply with me. Maybe it’s because of current world events, being a new dad, or a combination of the three. Whatever the cause, I loved The Two Towers. Were the trilogy to end differently, I still think this middle book would be true and worthy of a read. Share the post "“The burned hand teaches best.”"
You know it’s a great book when you choke up simply reading the review! This really struck a chord with me; excellent review.